"Every Thursday" will feature people of creativity and/or ideas of leadership throughout their work. 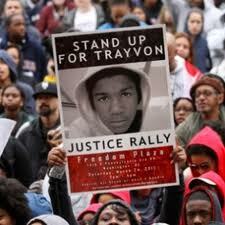 The memory of Trayvon Martin has spurred the nation into seeking Justice. Trayvon Martin was viciously taken by an individual whose heart is clearly diseased with hate. Martin killer's identity symbolically now represents injustice, mental illness and evil mischief. Consequently, Young Brother Martin is not only a symbol for what is wrong in America, but more so his name is symbolic for establishing unity and a fight for social justice - on local and national levels. This event is writing a narrative for justice, while unfolding a violent history of aggression against people of color. Americans are speaking and expressing thoughts of sentimental value not just for themselves or their ethnicity, but for mankind as a whole. Browsing the internet pictures of various groups and professionals are displaying a desire for change, and our young brother's memory is leading the charge. His memory is creating dialogue, sparking actions, and organizing communities. Grass-root organizations are identifying and building leaders to direct power against a society; whose local level of law enforcement fail its community in allocating true justice for people of color. By the Creator's Permission, Trayvon's memory is applying tension and testing relationships for Justice to surface and answer prayers. Clearly we are witnessing justice seekers sacrificing their influence for speaking the truth. May the prayers of our Young Brother, Trayvon Martin's parents be answered. Every Thursday recognizes your son as a resting Leader...major Respect and Love - amen. Create-A-Voice, a Registered Domain and Intellectual Property of Baseerah Media ©2011. Simple theme. Powered by Blogger.